We are delighted to launch Huff Puff House! 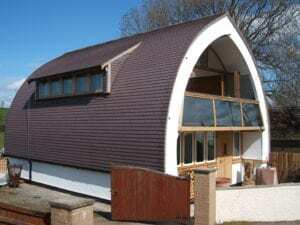 An eco-friendly, energy efficient and truly affordable self build home. Visit www.huffpuffhouse.com to find out more. Over the last year we have been working closely with Brian Waite, the talented designer, to be able to bring this stunning design the largest possible audience. Previously called ‘strawbalehouse’ we have rebranded the design to bring it fully into the Huff and Puff fold. With a range of sizes and options, we feel this could be a game-changer for affordable, energy efficient housing in the UK and beyond. For example, the kit that could help make a generous 12m x 6.5m, 120sq m home, costs just £36,000 (£30,000 +VAT). With your own labour, and help where necessary, such a build could be completed for less than £100,000. We can provide you with the kit and extra services if you need them, such as help with design, planning, building control, training and construction. As little or as much help as you need. Order our upfront design service (normally £500 or less) and once you have your planning permission and order a kit we’ll deduct that cost, up to £500, from the cost of your order! 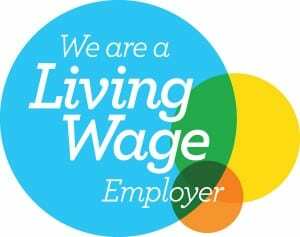 Please take a look around the website – www.huffpuffhouse.com – for more information – and if you would like any assistance please email [email protected]. 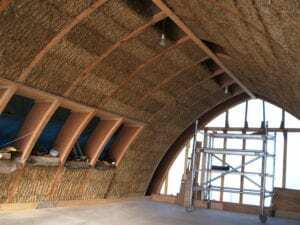 We’re sponsoring the Big Straw Bale Gathering 2018!